An undated handout rendering of California's high-speed rail project. The state's leaders have rallied around a plan to build a rail line from Los Angeles to San Francisco, in the face of seemingly insurmountable political and fiscal obstacles. Judge Michael Kenny didn't completely derail California's bullet train this week. However, in ruling on two lawsuits challenging Gov. Jerry Brown's pet project, Kenny told the California High-Speed Rail Authority to slow down and stop sidestepping requirements in a 2008 ballot measure. By rejecting the state's specious legal arguments, refusing to validate the issuance of state bonds and insisting on a complete financial plan as the law requires, Kenny signaled a strict attitude that could bode ill for the project in another big legal challenge next year. 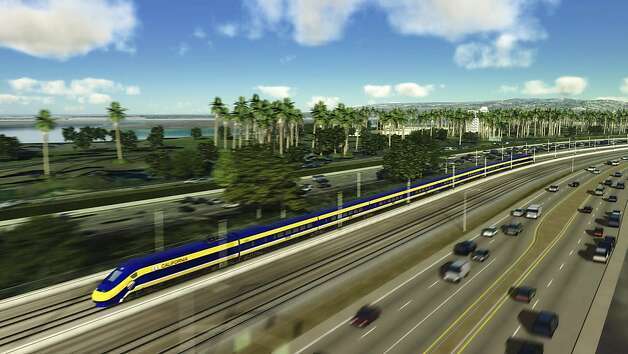 While the project's Kings County opponents didn't get everything they sought in the rulings, one of their lawyers, Stuart Flashman, accurately said they "are a major setback for the High-Speed Rail Authority. They need to step back and rethink their whole approach." Without the ballot measure's restrictions, it probably would have failed, but it's also evident that as now envisioned, the project cannot meet all of the law's requirements. One of Kenny's rulings says, in effect, that the state can't build that short stretch in the San Joaquin Valley without a plan that lays out how a much longer stretch from Merced to Southern California can be financed. The judge's strict constructionist attitude toward the law governing the project could bite again when he weighs another suit that alleges other ballot measure standards are being ignored - such as requiring a 160-minute ride from downtown San Francisco to downtown Los Angeles. As originally envisioned, the bullet train might have met the requirement, but to quiet stiff opposition on the San Francisco Peninsula, project managers devised a "blended system" that merges high-speed service with local commuter rail. The bullet train folks have theorized that a blended system could meet the 160-minute standard, but it's based on assumptions that defy common sense. It's time for a backspace-delete. Brown should acknowledge that the project as now planned is doomed and either kill it or go back to the voters with a revision that includes realistic routes and costs and lays out how it will be financed. If it's worth doing - a debatable point - it's worth doing right and not with legal sleight-of-hand and pie-in-the-sky financing.